A neuroscientist, a physicist and a biologist walk into a studio – and the outcome is a pretty tasty account of what they've been working on to achieve debut release First Flight. Dankworth Prize-winning composer Chris McMurran (piano), Arvin Vaghela (double bass) and Alexander Blackwell (drums) lift their trio recording off the runway with seven originals and an interpretation of a popular standard, fronted by original cover art which appears to nod to the mathematical, graphic genius of M C Escher. 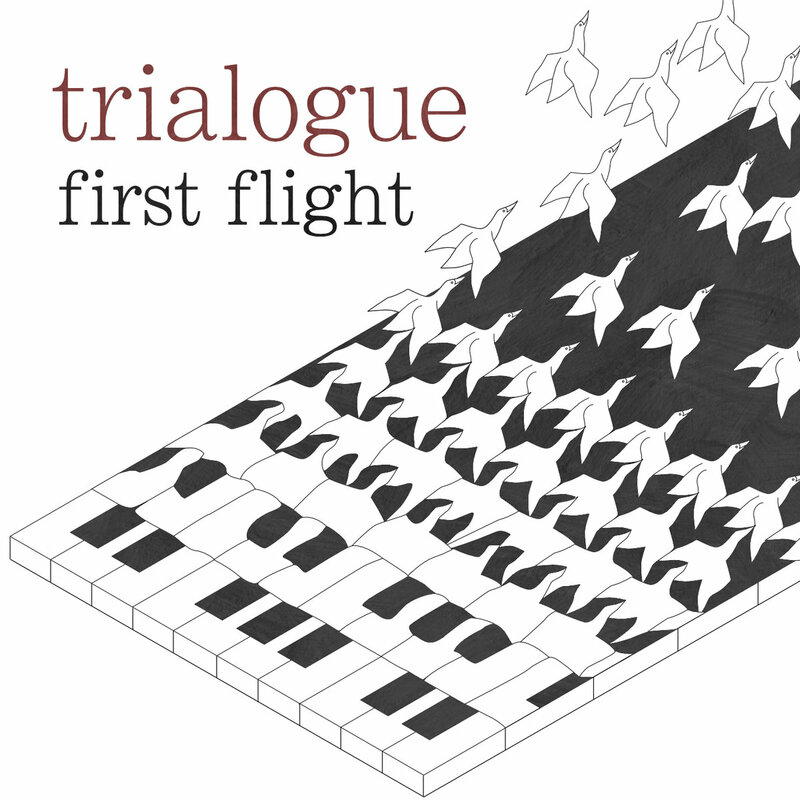 Trialogue was formed in 2015, the Cambridge scientists’ common connection informing this jazz definition of a three-sided conversation, with some compositions referencing appropriately scholarly subjects; and their combined influences are quoted as ranging from Oscar Peterson, Brad Mehldau and Avishai Cohen to Beethoven, Schnittke and Jimi Hendrix. A cursory listen across these accessible 57 minutes may imply standard piano trio fare. But rather than simply sitting back into routine progressions/changes, a written and improvisatory intent to create differing threads of interest becomes more and more discernable – it’s a particular strength. A prime example is Chris McMurran’s standout number, Lunar, braiding bass-bubbling Balkan rhythms and crisp percussion with baroque-inflected piano – a snappy, animated dialogue which avoids predictability. Ground State’s subtle rock riffs and dynamic precision colour this blithe outing, whilst the climbing folk-rock phrases of Petrichor open out into spacial simplicity led by bright piano extemporisations. An exploration of Rodgers & Hammerstein’s My Favourite Things is less of a pull – perhaps it’s the melodic overfamiliarity (Coltrane and countless others have been there before), and the trio go on to prove that their own compositional invention is strong enough. Alexander Blackwell’s pealing miniature, Seven Sounds, introduces a minimalist facet whose fade-out suggests it may be the gateway to future experimental paths, whilst Bhāskara's Wheel – “the fruitless quest to develop a perpetual motion machine” – centres around an especially charming, homely theme in Abdullah Ibrahim vein. Mother Tongue’s chipper blues – “a transcription from our own genome: the gene FOXP2, which was central to humans evolving speech and language” – swings to a Bouncing with Bud exuberance, its sudden rhythmic hiatus (at 0:44) the kind of attractive feature that should be rolled out further. Extensive title track First Flight (written by Vaghela and loosely inspired by Herbie Hancock’s Maiden Voyage) preens itself with newborn wonder and openness, described by the trio as a metaphor for this “leap from the nest and into the unknown”. Certainly, their creative potential – which might benefit from bolstering the harder-grooving streaks occasionally revealed – is unquestionable in an entrée album which is a pleasure to get to know.